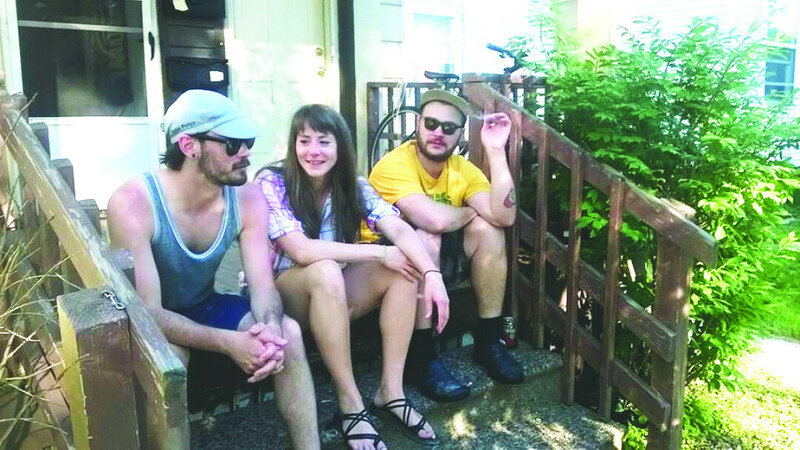 The beer-soaked songs of new Eau Claire band Pit Wagon exist in the space where country, folk, and the blues all intersect. “It’s music made for porches,” said Matthew Vold, the primary songwriter for the band. The trio, made up of Vold (vocals and guitar), Matthew Mabis (a lot of banjo, some vocals, and a little bit of guitar), and Emily Jensen (vocals and the occasional kazoo solo), make music that puts their own youthful spin on traditions rooted in the tried-and-true, tale-spinning songs of old country, folk, and blues greats — the kind of songs that can make listeners laugh and cry in the same three minutes. “They’re songs about love and loss that don’t take themselves too seriously,” Jensen said. Pit Wagon’s songs also often invoke the countryside – but this isn’t the backwoods bravado of today’s country hits. With lyrics like, “I need to live on land that no one owns / I want to feel the earth inside my bones / I want to live in the country” the band comes off very earnestly, and in an age where so much time is spent indoors and behind screens, these words have a real poignancy. It’s not all earnestness and pining, though. A lot of the songs are the kind of boisterous and boozy numbers that invite sing-alongs. “We just want to have fun,” Mabis said. “We want to have fun and the listeners to have fun.” Musically the trio complements each other nicely; Vold’s voice is full of character – a raspy, cigarette-whittled instrument that gives the songs gravity. Jensen’s voice offers a sweeter counterpoint: if Vold’s voice gives the songs grit, Jensen’s gives them grace; if Vold’s voice is a shot of bourbon whiskey, Jensen’s is the chaser. Add in the friendly twang of Mabis’s banjo and the joined three-part harmonies on many of the songs and the result is music that is undeniably pretty, but with an edge. It’s an exciting time for the old souls of Pit Wagon: they have a video for their song “Bar Smoke” on YouTube and in the coming weeks the trio plans to cut their first album as well as take their acoustic story-songs to stages (and porches) throughout the area.